Snapchat's Cannes activation is outside the Palais. CANNES, France—Snapchat’s advertisements—particularly the out-of-home variety—are known for cryptic copy and fun messaging that only its millions of loyal users can decipher. But for Cannes, Snap is going big with a splashy Ferris wheel that’s already the talk of the Croisette. The carnival-size ride is positioned in front of the Palais where more than 15,000 marketers and creatives will appear this week. 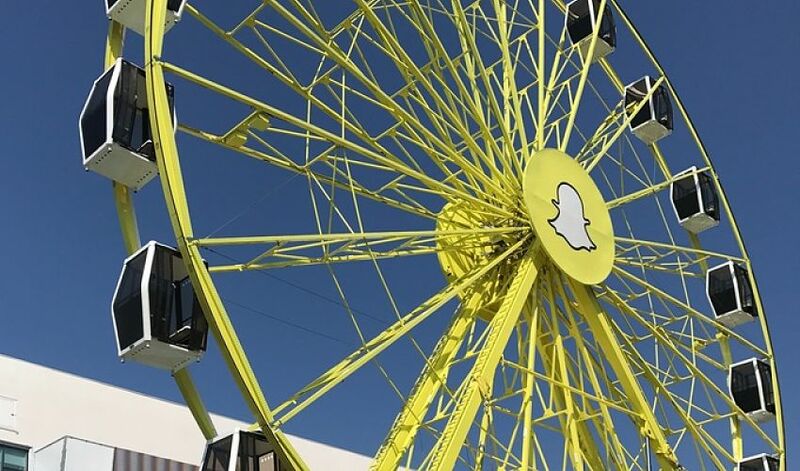 The wheel is decked out in Snap Inc. branding, including canary yellow paint and a ghost logo that appears in the form of a giant hubcap for the wheel. The attraction is open from noon to midnight during the festival and features 21 cars that, at four passengers each, means 84 people can ride on the huge yellow contraption. Strategically positioned QR code-like Snapcodes unlock a festival-themed lens that overlays a pair of sunglasses and the word “Cannes” within the Snapchat app. Snap has also set up a Spectacles vending machine nearby, possibly to persuade marketers to check out its video-recording sunglasses. Interestingly, Snap’s arch competitor, the Facebook-owned Instagram, has its installation set up within the Palace this year, too, and is a few floors above Snapchat’s activation. While Snapchat has had a big presence at the festival for the past few years, execs this year plan to pitch marketers on a new agency-certification program, its self-serve platform and creative tools that help with editing.